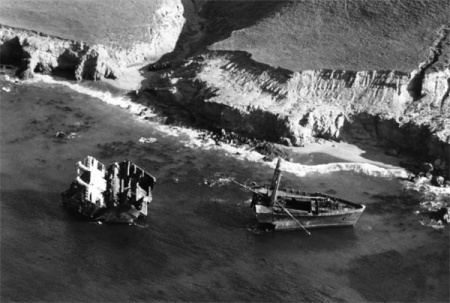 The freighter Chickasawaground on the south side of Santa Rosa Island, 1962. 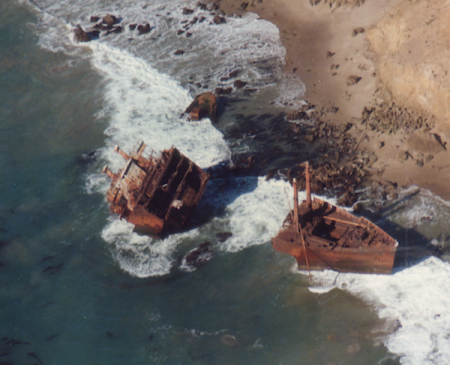 The freighter Chickasaw, ran aground on the south side of Santa Rosa Island in a heavy storm in 1962. Chickasaw (#241993) (1942-1962), 439-foot 5185-ton steel American flag freighter built in New Jersey in 1942. She was a mass-produced C-2 type cargo transport and served as a U.S. Navy transport, the U.S.S. Thurston, operating in both Europe (Normandy) and the Pacific until 1946. Two years after the war she was sold to the Waterman Steamship Company of Mobile, Alabama, demilitarized and renamed Chickasaw. 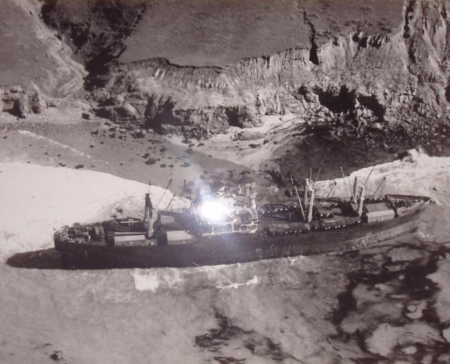 The vessel was bound for Wilmington, California from Yokohama, Japan when, in a heavy drizzle and dense fog, she ran aground February 7, 1962 on the south side of Santa Rosa Island between Cluster Point and South Point. Her cargo included toys, plywood, dishes and optical supplies, and she carried a crew of 46 plus 4 elderly tourists. Local tug vessels stood by for better weather hoping to free Chickasaw, but they were unsuccessful. As she lay broadside to the beach with her bow facing east, her crew and four passengers were aided in their rescue by the 669th Air Control and Warning Squadron stationed at Johnson’s Lee. where a Coast Guard cutter transferred them to Santa Barbara. The ship’s captain was Emmanuel Petronas. By February 18, 1962 she was officially abandoned, and her wreck has been disintegrating for over half a century. Her salvage rights were purchased for $2500 by Alvin Kidman and his partner, Pete Sliskovitch, and they were able to remove brass, copper, wiring, electric motors and turban pieces. This page was last edited on 18 July 2016, at 07:31.